I almost peed my pants with excitement! You see, next to dark rye bread, Anadama bread and the perfect French baguette, there is no other bread in this world I love more than Sweet Portuguese Bread. You see, I have had an almost 45 year love affair with Sweet Portuguese Bread ever since the first time my Auntie Nora took me to one of the many Portuguese bakeries Fall River, MA to help pick up the rolls for weekends at the summer house on Long Lake. I remember walking into the bakery with the windows all steamed up from the summer heat, standing in line with all the other ladies from New Bedford, Fall River, Tiverton, and the surrounding communities waiting for our turn, the sweet lady behind the counter who would always give me a roll or cookie to "munch on" while I waited for my Aunt to have her rolls and desserts wrapped. I would then sit in the front seat all the way back to the summer house with a big box of still warm buns in my lap. Those buns were so yellow from the eggs and soft, shiny and melt in your mouth good. 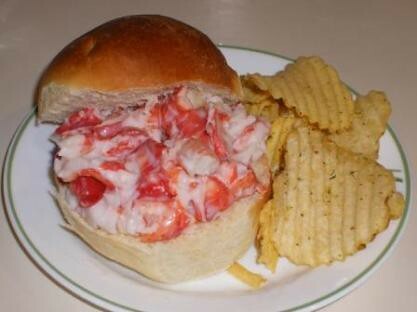 We would have those rolls with fresh chunks of lobster in a light mixture of mayonnaise and lemon juice while sitting out on the back deck watching the sun go down over the lake and further out the distance the Atlantic Ocean. The recipe that Tanna had us follow was an almost perfect match for those sweet rolls I remember from my childhood summers. The rolls I made from the dough (sorry Tanna, I wanted to be 10 again) were sweet without being over sweet like so many recipes for Sweet Portuguese Bread I've tried in the past. They were soft inside with a firm, slightly chewy crust that was dark brown, leading to a nice contrast to the yellowish insides. 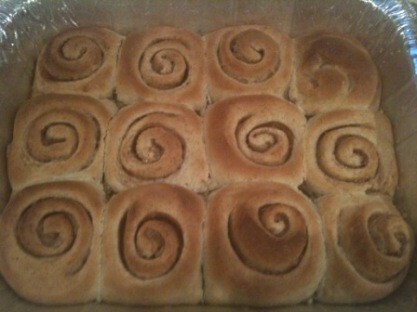 I also strayed from the recipe by not marking the tops of my buns or long rolls like Tanna's recipe, again wanting to recreate the rolls of my childhood. 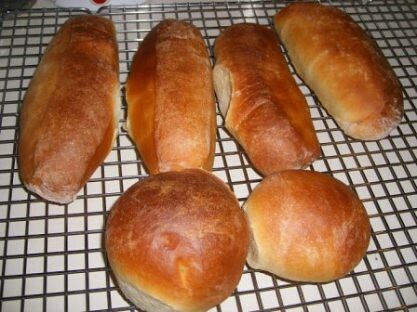 Because you see, I had a special plan for my rolls of Sweet Portuguese Bread. I wanted lobster rolls. 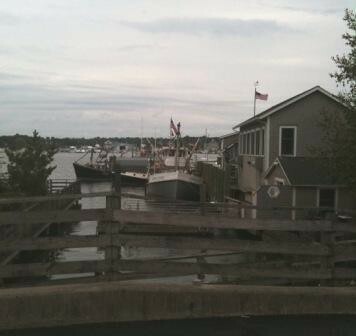 There is a lobster pound down the street from my apartment where the lobster boats from Long Island Sound come in and off load their catch for the area restaurants. This morning, on my way to my coffee shop, I stopped by and spoke with one of the guys on the boat about buying a lobster from them. He said to come back at 3pm when they were back and the restaurants had picked up their catch and if there was an orphan or "damaged" lobster, it was mine. 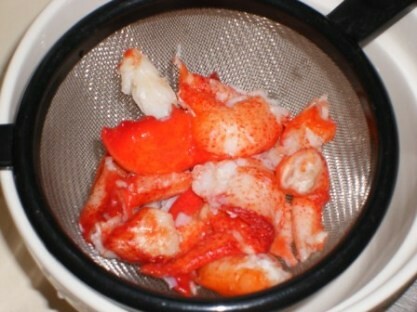 At 3:35pm this after a 1 1/2lb lobster found its way into my kitchen and into my steaming pot and about 12 minutes later I had a lovely pile of lobster meat. I pulled the lobster meat from the fridge, dressed it with a tablespoon of mayonnaise and squeeze of lemon. 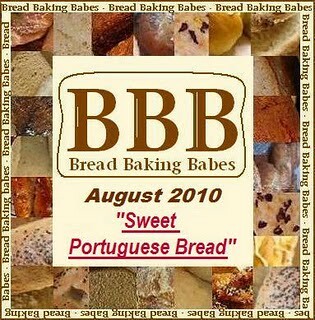 If you want to see what my fellow Babes did with their Sweet Portuguese Bread go visit the blogs over there on my side bar. You'll notice a few new names there too! Last month we welcomed four new Babes, Astrid, Elizabeth, Elle, and Susan to our ranks to help keep our group lively. You'll also notice that a few of us are on hiatus: Gretchen, Katie, and Monique. They will still join us from time to time to bake when their hectic lives allow. I'm trying to be a better Babe and bake more often as my crazy schedule allows as well. If you want to be a Bread Baking Buddy, you can bake this fantastic tasting bread, post about it by August 29, and email Tanna, our Kitchen of the Month with a link to your post. She'll email you a nifty badge for your blog and include you in her round up. 120 milliliters milk, room temp. Mix together the sponge the night before baking the bread. Leave sitting at room temp 8 to 12 hours. Beat sugar and butter until creamy. Add zest and salt and beat. Beat in each egg separately and completely; mix will appear curdled. Stir in milk and sponge. 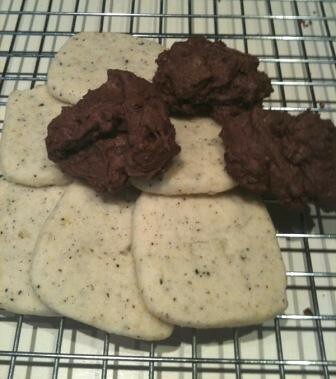 Dough should be smooth, soft and very supple with a slight stickiness. Looks a little like very thick cake batter or a brioche dough. Shape into ball, oil bowl and dough ball. Cover and allow to rise about 2 hours, should almost or triple in size. Divide into loaves, shaped into balls. Allow to rest 20 to 30 minutes before final shaping with rolling pin. Shape and place into well oiled cake pans seam side down. Allow to rise an hour to 2 hours; more than double in size. Brush with egg wash if you want that beautiful glossy finish. Brush with melted butter when hot from the oven. I know, there was a bit of a snafu last month but don't blame me. Blame Mom. It's her fault. (well, she doesn't think she lets me eat meatballs but I snuck one off her plate). But this month, Mom hasn't been so crazy at work and she has even been home for most of it so far. Which means she has been able to not only spend lots of quality time with me but also spend some time in the kitchen baking. 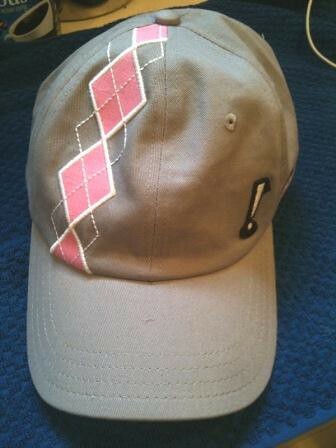 for a friend who is a caddy on the PGA Tour. Because Mom hasn't been working so much this month, she has gotten to spend more time on the golf course too! Which makes both Mom and me very happy because she isn't cranky. Mom is going on a special golf trip next month with her friends from The Hackers Paradise at the PGA National Resort. She says there is a really tough golf course there that the PGA pros play a tournament on and that has three really scary holes called "The Bear Trap". So she has been practicing really hard. 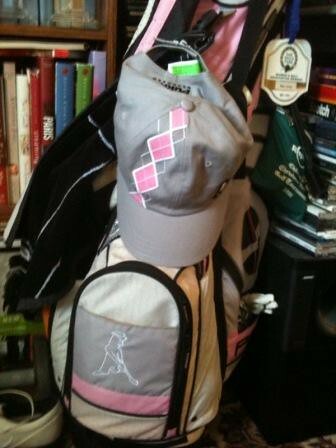 She is golfing this afternoon with her upstairs neighbor and said she was going to show off her new hat. The weather is perfectly sunny and nice. Tomorrow she told me she was going to golf early in the morning and then spend the afternoon baking and catching up on laundry. 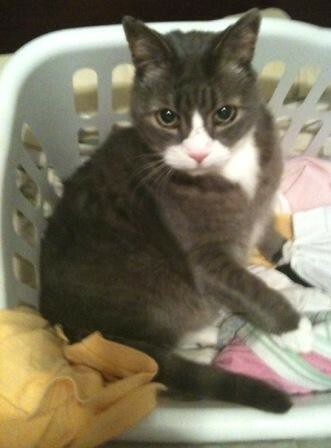 The laundry basket full of warm clothes! If you would like to join us this for Weekend Cat Blogging and show us what you are up to or where you are napping or what food you are stealing from your Mom and/or Dad's plates, leave a link in the comments. 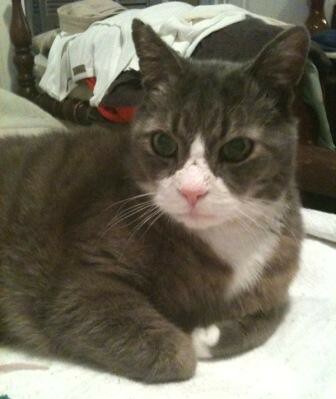 And, don't forget to check back on Sunday evening and read the comments from all the kitties!